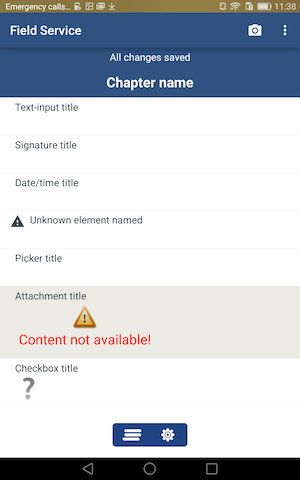 The Checklist List screen is used to view and manage the checklists that are used in the mobile app by technicians, such as selecting the object and record with which to associate the checklist or determining whether the checklist is mandatory. Additionally, the Checklist List screen can help you see important information about the checklist, such as whether it has been completed, by whom, and when. 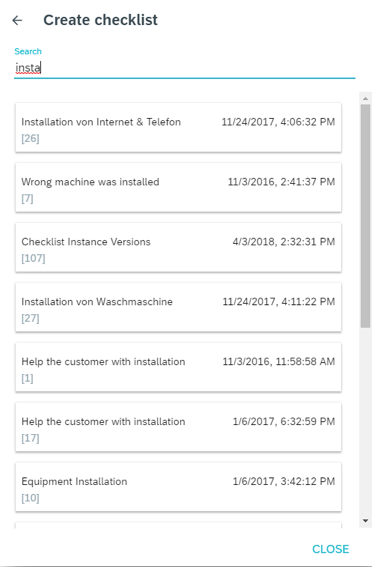 A checklist instance is a unique record in which a template has been used/completed. 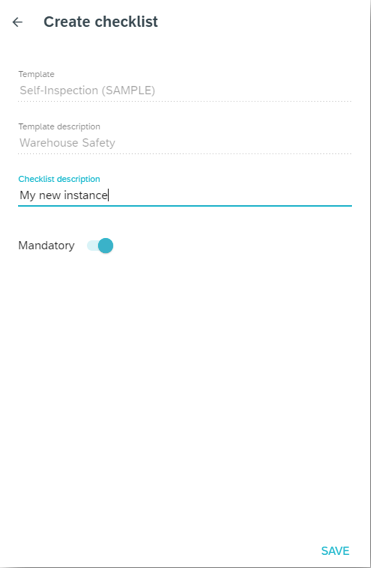 Checklist instances are created in Workforce Management, or in the Andorid or iOS mobile application by the technician/end-user. Category The category associated with the checklist. The category is assigned when first creating a new checklist template. Name The name of the checklist. This name is taken from the template. Template Description If applicable, the description given for the template when the template was created/edited. Template Version The current template version on which the checklist is based. Revision If applicable, the current revision of the template version on which the checklist is based. Language The template language on which the checklist is based. Instance Description The description of the checklist instance made by the technician. Closed Checkbox. If checked, indicates the checklist instance has been completed and closed. Mandatory Checkbox. If checked, indicates that the checklist is mandatory. A checklist can be made mandatory when adding a new checklist (see Add Checklist Workflow below). Responsible The technician assigned to the checklist. Linked Object The object to which the checklist is linked. Options include: Business Partner, Activity, Service Call, Sales Order, Equipment. Last Update The date/time on which the checklist instance was last updated, such as when it was edited or closed by the technician, or added in the Checklist List screen. First you will select a template upon which to base an object-linked checklist. Next you will choose the object to which to link it. Please note that only objects that have records associated with them can be linked to checklists. Next, you will select a record to which to assign the checklist. Imagine having a specific checklist for a specific piece of equipment. Finally, you can select whether or not the checklist for linked object record is mandatory or not. 1. Select Template 2. Select Linked Object 3. Select Record 4. Mandatory? The first thing you'll need to do is select the template you would like to base a checklist on. You can view all available temlates, or filter by category. Net, you'll select the object with which you wish to link the checklist. For example, the equipment obect. Now, you can select the record with which to associate the checklist record. For example, an assembly checklist could be linked with the equipment record for which it is applicable. Finally, before saving, you can indicate whether the checklist is mandatory or not. When the checklist is mandatory, the technician will be required to complete it before the activity or service call can be completed and closed. In addition, you can also provide a description for the checklist instance in the Checklist Description. This description will display in the Checklist Instance column.